What are the most popular shades of gray paint? How to pick the best shade of gray and which grays are most stylish? Gray is now the most popular color for paint…in fact, it has surpassed white! 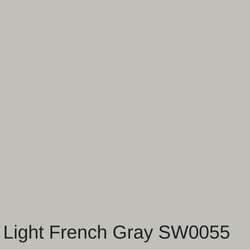 If you look at Sherwin William’s Top 50 paint shades, the #1 shade is a gray! 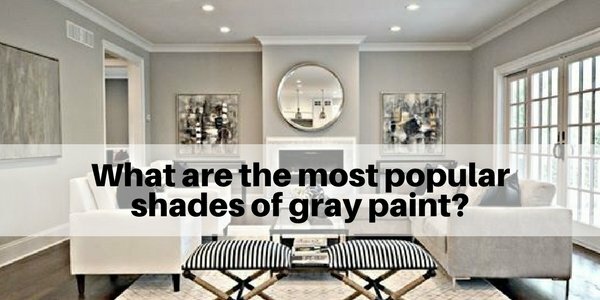 In fact, among the top 50 paint shades, 20 of them are gray. And, if you look at the color wheel, you’ll see there are tons of grays. But, how do you know the right gray to use? Please note that this article may contain affiliate links. See my full disclosure at the bottom of the page. Why is gray so popular? Cool tones are in style, while warm tones have become less popular over the last decade. This seems to be true both for floors and walls. 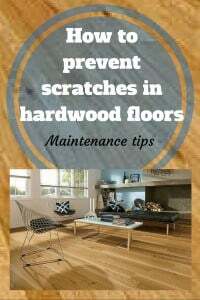 For hardwood floors, dark floors are by far the most popular and continue to rapidly grow. And, gray naturally goes with dark wood floors. It’s hard to say which came first – the gray walls or the dark floors – it’s kind of like a chicken and egg phenomenon. But, they are growing hand and hand. 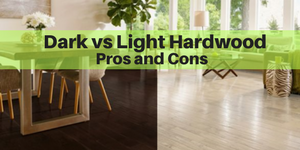 Related article: Dark vs Light hardwood. Pros and Cons. 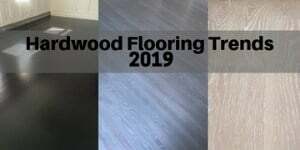 What’s been interesting is over the last 3 years or so, even when customers have light floors, they are also choosing gray for their paint color. 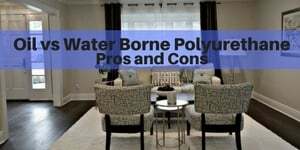 It just seems to work, especially for those that are using a water borne poly (see the best brands of polyurethane here). Bona Traffic HD has been rapidly rising in popularity as it’s lighter, paler and less yellow (again, the desire for cooler tones and avoidance of warm colors). For our painting customers, we have found that 80% prefer cool tones, while only 20% prefer warm tones. Warmer tones are made with oranges, yellows and reds. They remind us of heat and the sun. They tend to make rooms cozier and more intimate. They tend to make spaces look smaller. Cooler tones include blues, grays, greens, light purples (or mixtures of that include these undertones). They are more soothing and calming. They remind us of the sky and water. Cooler tones tend to recede and hence make spaces look larger. Gray is both chic and neutral. So, it’s super easy to decorate with. It goes with almost everything. It’s the new neutral. Years ago, it was beige, but beige has become a bit boring. Most homeowners, especially those that focus on style, opt for the trendier and more stylish gray. As a general rule, going lighter gray (rather than darker) tends to look better. It gives a fresh and airy look without making your space look too dark. We help our customers with paint color selection (via a free color consultation – see more below). We know that choosing the paint shade is one of the most common fears among painting customers. Most homeowners don’t have experience or confidence in selecting the right shade. That’s where we provide extra value. 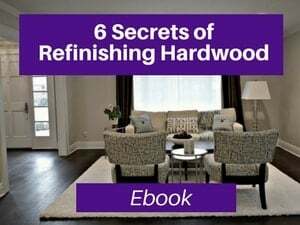 If you walk into a home and you’re super impressed with the paint color selection, chances are that they they had a design expert assist them in the process. Most painters just ask the homeowner which paint color they want to use. But, at WOW 1 Day Painting, we go the extra mile and consult with our customers. We treat them like clients because we want them to be thrilled with their painting job. We even give them free samples to test the colors in their own home…because the paint can look different on the walls than on the paint swatch…and it can look different in different lighting, and different times of the day and on different walls, so definitely test using the samplers. 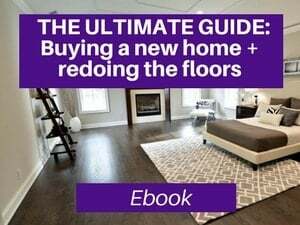 So, I thought I’d share our learning with you from helping hundreds and hundreds of customers on selecting the RIGHT gray for their homes. These are our 4 most popular grays…the ones we love, and based on tons of consumer feedback, what they like the best. We generally use Sherwin Williams paint, because their paint is outstanding quality and also reasonably priced, so these are our top picks for Sherwin Williams Grays. Sherwin Williams is available nationwide. (We use Benjamin Moore as well, but it’s more of a regional brand). Gray Screen is actually Sherwin Williams’ #1 color. It’s a cool gray with blue undertones and it’s exquisite. It’s light, too so it goes really well with dark hardwood floors and almost all types of furniture. Another reason Gray Screen is so popular is that has several coordinating darker grays that are great for accent walls (you can read more about accent colors below). Silverpointe is probably our most popular gray. It’s also a light gray, but this shade has some light green undertones for a cool, but slightly warmer look vs Gray Screen. It’s light and neutral, so it’s also great with dark hardwood. And, if you have light hardwood, Silverpointe tends to complement the light floors a bit better due to it’s taupy undertones (taupe = gray + green), so this is technically a mixture of gray and taupe. 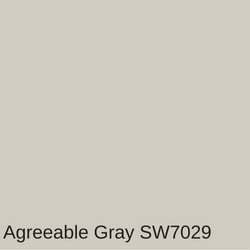 Agreeable gray is a gray with brown undertones (and some very subtle yellow undertones). It works well when you room has a mixture of grays and browns. Even though it has some brown and yellow undertones, it reads as gray. Light French Gray is what I would classify as a gray gray. It’s from their historic classics line and it’s what I would call more of a pure color. In my opinion, it’s pure gray. I hope that makes sense. Please note that the exact gray you select may vary from this. Different grays work in different homes based on your lighting, your floors, your furniture/area rugs and your taste. All of these grays are neutral and on the light side. 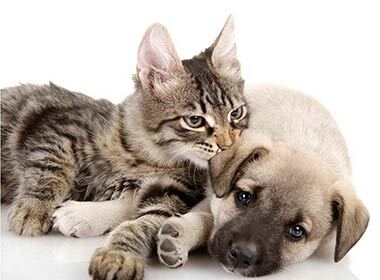 As a result, they will work in most homes and I feel that you can’t go wrong with any of them. 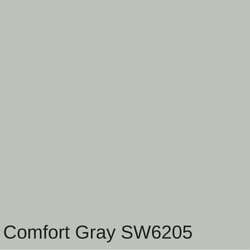 If you are planning to do a gray accent wall, your gray color selection will be even more critical (see below). Oh, and Sherwin Williams has a very useful app that allows you to select colors, as well as visualize those colors in your room. It’s called ColorSnap and it’s available for iphones, androids, ipads and there’s web version you can use on your computer. When you look at each of the above samples in isolation, they each look gray. But, there are subtle differences, and they become more obvious when you place them together as you can see in this collage. Remember, you need to test these on your walls…the colors will look different in different lighting and can vary based on your floor color and time of day. They can also look different on different walls. So, test test test. And, remember, in the end, you will only have 1 paint color, so don’t worry about how the paints looks next to each other. Only worry about what you like and what looks good in your home. It may help you if you use white pieces of paper to look at the swatches on your wall separately. In general, I’d recommend doing a flat finish for gray walls (as well as other colors). Flat finish is the most stylish (and often when you see paint that looks cheap or dated it’s an eggshell or glossier finish. 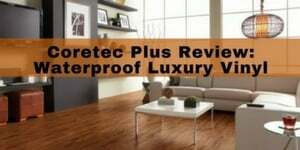 Flat finishes look up to date and they also hide imperfections in the wall better. (If your walls are less smooth or have imperfections, it will show more the glossier you go…as the glossier finishes reflect light more and highlight the issues you may have in your walls). 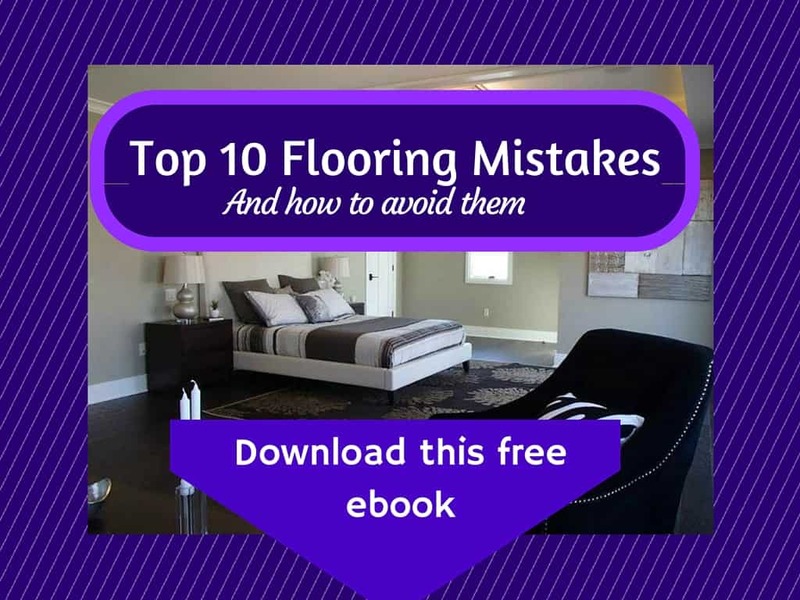 The challenge with many flat finishes is that they are less wipeable, and this is a key concern especially among households with younger kids and/or pets. The glossier you go, the easier it is to wipe things off, but the more dated your walls look. Thankfully, Sherwin Williams has a wonderful line that solves this dilemma. Their Duration line allows you to have a flat finish that is also wipeable. It’s more expensive, but completely worth it. Now, before I get into accent walls, I wanted to share a VERY helpful video from Sherwin Williams, with some quick and super useful DIY painting tips. It’s just 2 minutes and covers types of brushes and painting techniques. Also, towards the end of this article, I share the painting tools and accessories that we use (with links to buy them on Amazon). Accent walls have become trendy and in the right shaped room, they can look awesome. (I’m going to write a separate article on that soon). When you want to do an accent wall in the same color family (e.g. light gray/dark gray), Sherwin Williams makes it easy, if you use their color wheel. Basically, you want to look at the grays on the same color strip and then go at least 2 shades deeper (i.e. darker). Generally 2-4 shades darker will work and on some strips you can go up to 5 shades darker. (It will vary a bit vs the color you select. The one thing you DON’T want to do is pick something that is 1 shade darker. If you do this, it will usually look like you made a mistake. Instead, be purposeful and make sure there enough of a contrast. Are you ready to paint your home? Do you need help with color selection? Note: Due to popular demand, I’ve also started to offer phone consultations. 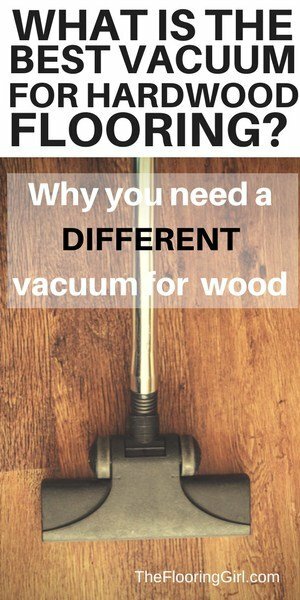 Should you paint or do the floors first? 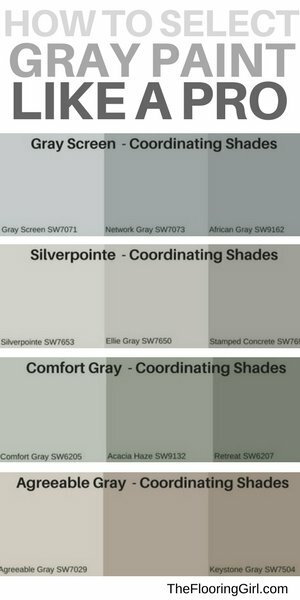 How to choose the best shades of gray for your home in Westchester County. Popular shades of gray and coordinating accent colors. Great article! It addressed all my concerns. 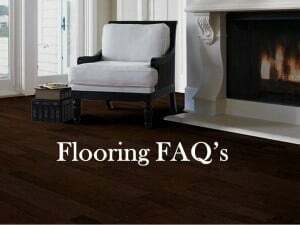 I have a flooring question. I’m painting my bedroom sea salt. I’m considering painting my floor in there a dark gray. What color gray would you recommend? Sherry – Thx so much. Oh, you should NOT use paint on your floor! 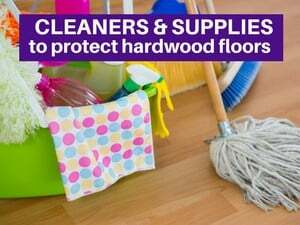 That will permanently damage your hardwood. (I’m assuming you have hardwood floors). The paint will seap into the cracks. 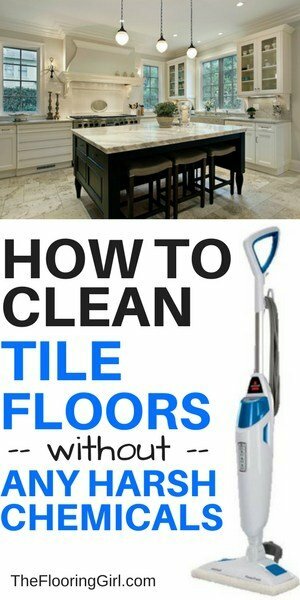 and, yes, I know people that have ruined their floors this way and need to replace them. Never use paint and never use a paint blend. I’m doing my accent wall River way but I’m having a hard time figuring out what color to use on rest of the walls.Thank you! Linda – Usually you choose the accent wall after the main color (since the main color will occupy most of the space). But, if you Sherwin Williams Riverway set up, then try Interesting Aqua SW6220, Rain SW6219 and Tradewind SW6218. those all coordinate together and they are listed from darkest to lightest. Interesting Aqua is 3 shades light, Rain is 4 shades, Tradewind is 5 shades lighter. They are all in the same color family. I have general paint color capricorn and am ha ing a hard time figuring out what other colors to coordinate with it? CJ – Hi. I don’t have that color in my paint swatches for Sherwin Williams or Benjamin Moore as it’s another brand. But, I would think that a lighter gray or darker gray would work (if you are asking about accent walls). You would want to take it to a paint store to see which shade of gray (you could get a paint chip or find a swatch from the manufacturer). Or, if you are asking what other colors, I would think that Navy would work well, whites, some other blues could work. You can also use pops of color for decor (e.g. yellow, magenta, etc.). Gray is neutral so it can go with almost anything. It just depends the on what you like. If you’re trying to go gray on gray, you can search General Paint CL 3233M Capricorn to see the color. I would probably go to a paint store and see what seems to go and bring some swatches home. Then, go back and get testers so you can sample it. I hope that helps. If it was Sherwin Williams or Benjamin Moore, this would be easier for me to do as I can see the color in real life (not a computer screen). I will be painting my home to sell and loved your suggestions. I do have a question about lighting. My entryway is so bright and has lots of light that i’m afraid Revere Pewter would look washed out. Likewise, my dining room is darker because the window has a covered patio. Should I just paint the entire first floor one color or would it be okay to paint the hallway one shade darker than Revere Pewter? Diana – In general, if you can use one color, that’s better and also lighter shades are better. So, I would try something like Revere Pewter (or one of the others here and try to use for all the areas. I think it’s better to avoid going darker. But, you can get tester samples and see what you think before committing to the color. We’re painting our living room and it’s oblong in shape. One short end has a floor to ceiling red brick fireplace while the opposite short end is a large picture window. Which wall should an accent color be added? 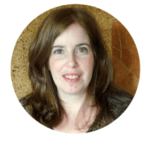 Dianna – There is no standard answer here…but I’d probably paint the brick the accent color, esp since most people don’t like the brick color and it severely limits your color choices and makes your room look darker. So, you wouldn’t want 2 dark walls. Either that, or probably none. I know this article is on interior colours but could you suggest an exterior grey to go with colourbond WALLABY roof. Deen – I’m sorry, I don’t know what a colourbond Wallaby roof looks like. But, generally you can use the same colors indoors and outdoors. The paint manufactures make most paints to work for both, but then you just get an exterior formulated product. You’ll have to get a sample of the roofing and look at it next to paint colors. Maybe you can order a sample from the manufacturer or else the company that installed your roof. we are selling our home and I am planning to paint my entire lower level in agreeable grey because there is a lot of honey oak trim. I would like to paint the kitchen (oak) cabinets white. Would you suggest a cabinet color that would look nice and be complimentary to our color scheme? We have stainless steel appliances. Thanks!! Great choices. Most whites will work. 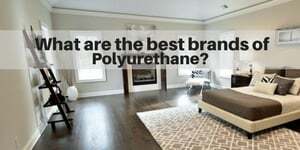 I would start with Sherwin Williams Pure White. Or, Highly reflective white. I hope that helps. Brad – I stand corrected then. I will need to adapt this article soon. Thanks for letting me know. 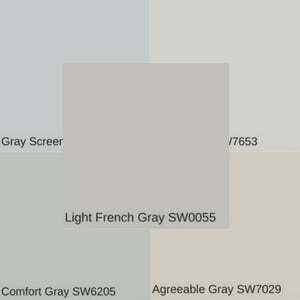 I am having a hard time selecting paint color for my house. I have honey oak cabinets, countertop has a combination colors of gray/black/beige and marble agreeable gray fireplace. What paint colors would you suggest? Thanks! This is one of those ones that needs to be done in person to see which exact shade goes best. Given your honey oak cabinets, if you keep them, I’d probably choose a gray that has a bit of warmth in it. I’d probably start with Silverpointe, repose gray and agreeable gray and see what works and then go from there. Hi Linda. Love your article. Very helpful. We have a long family room with floor to ceiling brick fireplace and an old rustic wood mantle that anchors one end. Floors are medium tone wood parquet. Currently I have that room painted in a beige tone with the brick one shade lighter. It’s subtle but has worked well. We are planning to sell and the entire house needs a new coat of paint. For this room, would you recommend uniform color or going a bit lighter for the brick? I’m thinking Agreeable Gray for walls since the parquet is a lighter finish. The room faces north so it doesn’t get a lot of natural light. Thanks. Tilly – I’d probably do it all one color, and agreeable gray is a great choice. I’m in process of writing an article for north facing rooms, and agreeable gray is one of my suggestions. Sorry for the delay in getting back to you. I’ve gotten so many comments, and it’s hard to keep up. I have need my kitchen my kitchen, den and breakfast area in agreeable gray. I Was considering painting the dining room a coordinating color to break things up. DO you recommend another color or should I stay with the same color throughout? Ann – I would recommend using the same color throughout as it will make your space look larger and more cohesive..
Cindy – This is a tough one due to the yellow in the birch. You will have to test the paints/order cards and look at them next to the cabinets and carpet. Between those 2 colors, I would probably recommend Agreeable gray over revere pewter as it’s a more contemporary color and the revere pewter is rather beige. But, you must look at both of them in real life in your home. A warm beige or greige can work…you just need to find the right one by looking at the samples next to your items. Heather – That’s odd that the color looks so different in the 2 adjoining rooms. It must be the lighting. Usually it’s better to continue w/ the same color and then your eye just color corrects, so it looks normal. Or else, you can, as you said, go a bit darker on same card. Normally, when I do an accent wall, I would go 2 shades darker (in this case that would be mega greige, but it sounds like anew gray is already too dark for you. I think I’d be inclined to stick w/ same color and test what it looks like (w/ a tester) right next to the kitchen. Also, make sure that you are using 2 coats of paint when you’re testing. If you’re just doing 1, that may be the problem. Hello! I am in the middle of repainting my family room, plus kitchen ( that basically flows from the family room and separated by a wide openning. I am also repainting a huge foyer. My house has an open floor plan so you can see my family room and the kitchen by standing in the foyer (NY floor is more of a.natural hardwood floor witn light brown undertone). I love gray warm colors and I paimee kitchen w Behr Titanium which turned blue. I want gray colors but everything keeps turning blue. I have large windows so the house gets lots of light. I actually asked my contractor to pause the project because I am confused. I also am considering alpaca w function gray accent but now afraid it will turn lavender. Also, would you keep all 3 rooms (kitchen, family, large foyer) same color? Thank you! Irina – Titanium is a cool gray. Also, I’m not a big fan of Behr paint as it’s thinner, so the color underneath may be shining through. Anyway, alpaca and functional gray should work well, but test it first. And, I would use a primer. Thank you for this post- so helpful! I am looking for a shade to cover most of the interior of my home. The trim is a very dark brown wood, and I would like to do a lighter color to brighten things up a bit, but don’t want too sharp of a contrast. I am considering Agreeable Gray, do you think that would work? Mallory – Yes, agreeable gray should work very well. (Also, Silverpointe, passive, repose gray or gray screen).